Do you know why I made this jam? Because organic pears were on sale for like, really cheap, and I couldn’t resist buying a boat load of them! I do love pears, and cardamom pairs perfectly with them. Did you see what I did there? Pears and pairs! I think myself rather witty! Any hoo, cardamom gives the jam a hint of a floral aroma, and it’s balanced out by lemon. I don’t know what the heck commercial pectin is made of, and since pectin occurs naturally in Granny Smith apples and lemon rind, that’s what I’m using to thicken the jam. Commercial pectin also requires a whole lot of sugar in order to gel, not so with natural pectin! I use honey to reduce the amount of refined sugar in Pear & Cardamom Jam, but I feel that some sugar helps with the gelling. 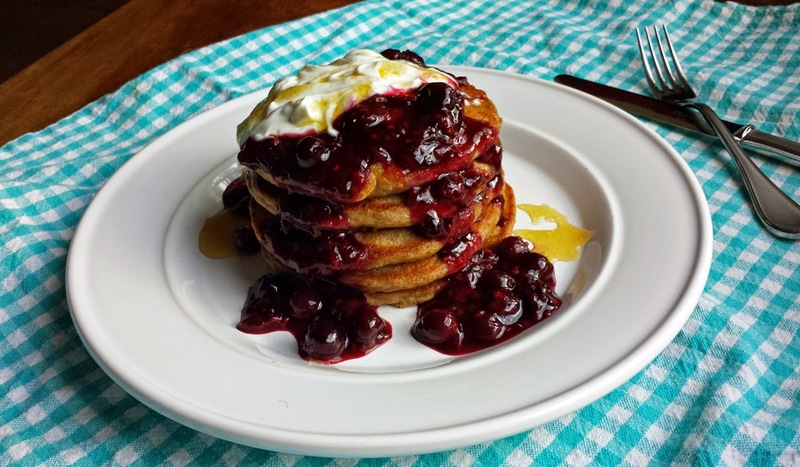 The amount of sugar used, including the honey, is less than half of a recipe that uses commercial pectin, so ya can taste the fruit! 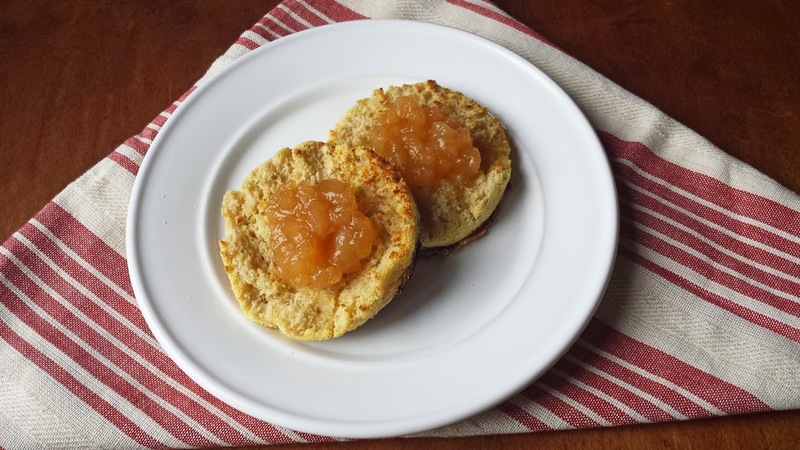 My favorite way to eat Pear & Cardamom Jam is on an English muffin or toast with melted butter…mmmmm. This is also great to serve with blue cheese for an appetizer or dessert. How about heated and served over ice cream. 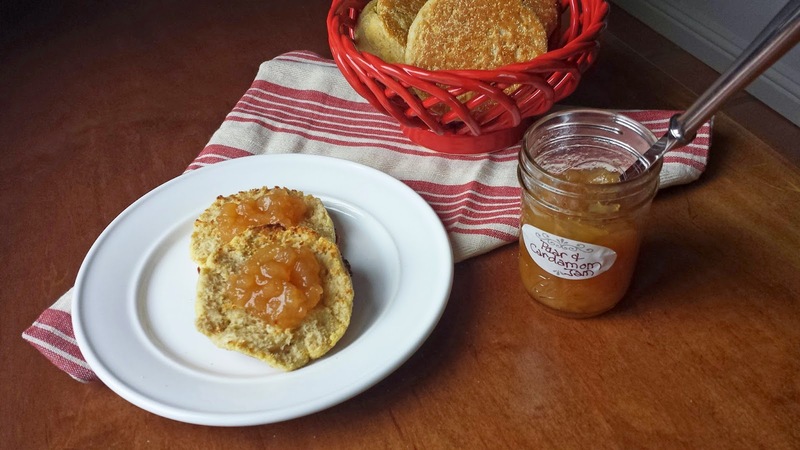 I can think of about a dozen uses for Pear & Cardamom Jam! For the fruit you'll need lots of peeled and diced pears, a couple of grated Granny Smith apples skin and all, and three lemons. Use a peeler to remove the zest from the lemons. Natural pectin is found in apples, and the skin as well as the core contains the most pectin, so don't throw out those cores. Lemon zest is for flavor, but it also contains pectin. Put all of the fruit into a large bowl with some sugar, honey, and the juice of those lemons. Give it a stir and tuck the apple cores in the mixture. Cover and refrigerate overnight. Break open some cardamom pods. Fish the zest and cores out of the refrigerated fruit, and add them to some cheese cloth with the cardamom. Tightly tie it closed. Add the fruit, and it's liquid, to a 6 quart stock pot. Add the cheese cloth pouch. Cook this over medium high-heat for 35 to 45 minutes, stirring frequently. I don't have special canning equipment. I just lay a towel in the bottom of a large stock pot to keep the jars from coming in direct contact with the heat. I also wind rubber bands around the tips of a pair of tongs, so that I can lift the jars out with out them slipping. While the jam is cooking fill a couple of large stock pots with water, and sterilize the jars and lids. To test the consistency of the jam, drop a bit of the hot jam on to a metal spoon which was put into the freezer before the jam was cooked. See how it's runny, that means that the jam isn't done yet. Return that spoon to the freezer. Check the jam again in a few minutes, when it gels and looks like jam, it's done! Remove the jam from the heat and mash it just slightly. The jars and lids should still be gently simmering in the hot water. Drain the jars, and fill them leaving 1/2 inch of headspace. The jars must come from the hot water otherwise the hot jam will breaks the jars. Wipe the rims of the jars with a clean, damp cloth. Put on the lids and the bands, and tighten only fingertip tight. Place the jars back into the stock pots that the jars were sterilized being sure that the jars are covered by about an inch of water. Bring the water to a boil, when the water boils, set the timer for 10 minutes. Remove the processed jam to a sheet pan covered with a dry towel. The lids will begin to pop as the vacuum seal is created. Tighten those bands a little tighter. Leave the jam in one place, to set up for a couple of days. If there are any jars that didn't seal place them in the refrigerator they'll last for several weeks. 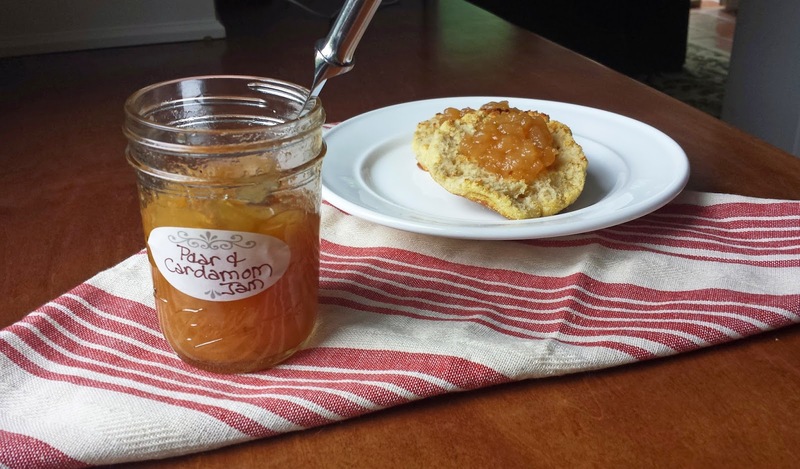 I had a lot of pears, cuz I got all excited by the sale, so this recipe makes a lot of Pear & Cardamom Jam. But hey; it makes great gifts, perhaps hostess gifts for the holidays. If you just don’t want that much jam, the recipe is easily cut in half. 1. Peel the pears and cut into small cubes (a little smaller than ½ inch), discard the peels and cores. Grate the flesh of the apples with their skin on, do not discard the cores. Add the diced pears, grated apple, lemon juice, lemon zest, sugar and honey to a large bowl; stir well. Tuck the apple cores down into the mixture. Cover and refrigerate overnight. 2. When you are ready to cook the jam: Place a large metal spoon in the freezer. Then in a large piece of cheese cloth add the cardamom pods, fold over the cheese cloth and use a mallet or a small pan to gently break open the cardamom pods. Remove the apple cores and lemon zest from the refrigerated pears and add them to the cheese cloth with the cardamom, fold the ends of the cheese cloth in and tie it tightly with kitchen twine. 3. Pour the pear mixture into a large (6 quart) pot. Add the cheese cloth pouch containing the cardamom, zest and cores. Bring to a boil over medium-high heat and cook for 35-45 minutes from the boiling point, stirring frequently, stirring especially as the mixture thickens. To test if the jam is done, remove the metal spoon from the freezer, drop just a tad of the hot jam on to the spoon, if it thickens the consistency of jam, then the jam is done, if it’s still runny continue to cook and stir the jam (remember to clean and return the spoon to the freezer so that you can test the jam again in a few minutes). Remove and discard the cheese cloth pouch. Use a potato masher, and just mash it a few times (five or six) to break up some of the pears, leave a good bit of chunky pears for texture, otherwise, you’ve got pear butter. 4. While the jam is cooking: If you’ve got a boiling water canner, prepare that according the manufacturer’s directions (no canner, see below). Also sterilize the jars the jars according to the manufacturer’s directions (no directions see below). 5. I like to work with half of the jars at a time. Fill the hot jars with the hot jam, (a canning funnel is helpful), leaving ½ inch of headspace. Clean the rims with a clean damp cloth. Top each jar with a lid, and apply each band just to fingertip tight. Return the filled jars to the pot (using the tongs); being sure that there is 1 inch of water over the top of the jars. Bring the water to a boil, and then cook for 10 minutes from the boiling point. Lay a dry towel on a sheet pan, remove the jars of processed jam to the pan, you should hear the tops pop as the vacuum seal forms. Tighten the bands. Leave the jars to set up in one place for a couple of days. If you had any leftover jam, put it into an airtight container and store in the refrigerator for a couple of weeks. Also if any of the jars didn't seal, refrigerate those, they'll keep for several weeks. Processed jam will last for about a year in the pantry; and then once opened, up to 9 months in the refrigerator. Notes: *This recipe is easily cut in half. **If you don’t have a canner; place a clean kitchen towel in the bottom of each large stock pot (you will need to pots to process 9 jars), this keeps the glass jars from coming in direct contact with the heat. Now you can fill it the pot with water and add the jars to it. Bring the water to a simmer, while the jam cooks. ***To sterilize the jars, place the jars, lids, and bands in the pots, and fill with water, cover the jars by at least an inch. Place the pots on the cook top and bring the water to a good simmer, just under a rolling boil. I like to simmer them for about 10 minutes, and then turn the water down to a gentle simmer while the jams finishes cooking, but be sure to leave the jars and lids in the water until the jam has finished cooking. ****No canning tongs, wrap the tips of your regular tongs with a few rubber bands. I love jams with interesting combinations. This sounds like a winner, I'm definitely going to have to try it! :) Have a great weekend Kari! Pears and cardamom...a winning combination, Kari.